THIS COLOURFUL DIY WEDDING IS THE SWEETEST! Meredith & Avelino are a fantastic couple with a love of laughing, color, family and friends so it is no surprise that their wedding day incorporated it all! Silver City, NM held great memories for the pair this was where they first met & started dating. Although the two of the eventually set up home elsewhere, after becoming engaged they naturally, picked Silver City as their wedding destination! Meredith and Avelino were able to select details that reflected their laid-back, light-hearted and fun personalities. They combined touches of vintage style, like Meredith’s birdcage veil and tea-length dress, with lots of modern and DIY touches such as the brides vibrant and organic bouquet, which was arranged by the bride herself. 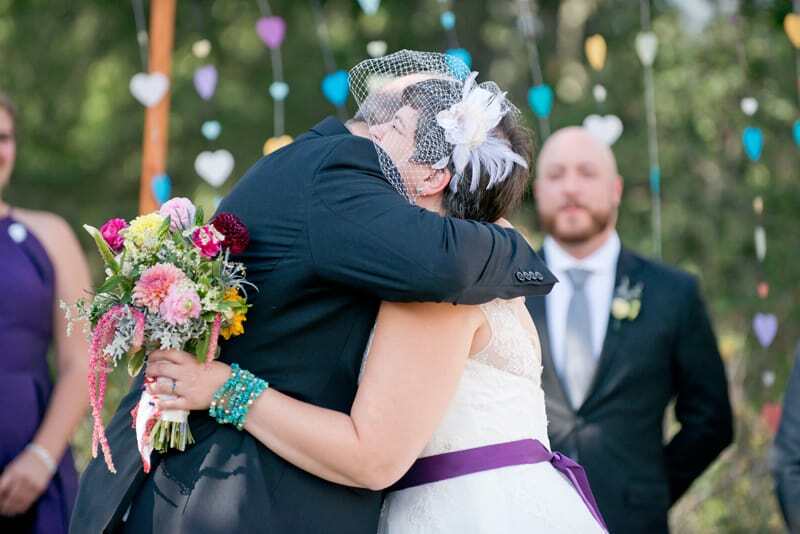 Tons of colorful paper hearts adorned their ceremony space, lined walkways and decorated their DIY ceremony arch. The couple shared personal and teary-eyed vows, all surrounded by family, friends, and the gorgeous New Mexican landscape, visible from around their venue at Bear Mountain Lodge. After the ceremony, guests danced the night away, enjoyed bubbles and homemade-jam-favors and a cozy stay & delicious breakfast at the lodge. I just love how colourful this wedding is!